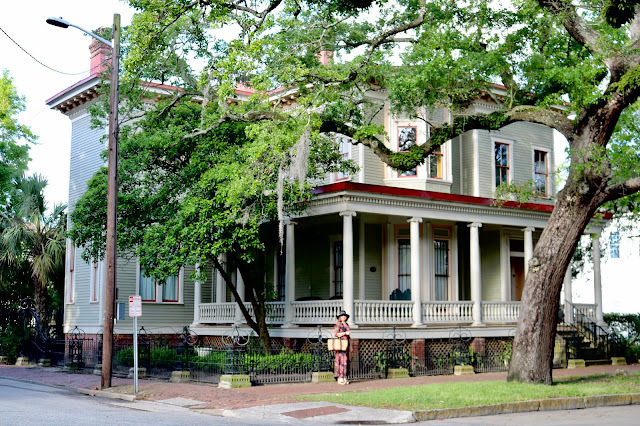 In last week's travel post, I shared our very first day in Savannah, Georgia. We arrived mid-morning and took a Trolley Ride to get a general overview of the area, then we checked into the home we would be staying in for the next four nights. Because the home was so beautiful and special, I wanted to do an entire travel post about it. 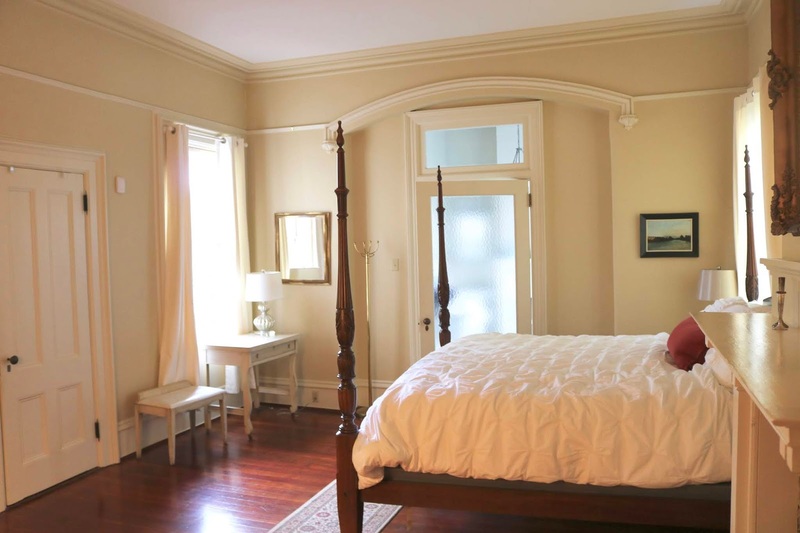 The Printmaker's Inn is a large historic home divided into four suites for travelers. We stayed in the Nicholas Suite. 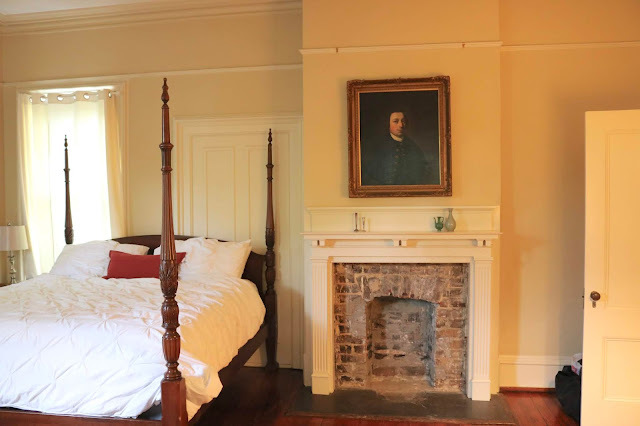 The home is called the Printmaker's Inn because it was built for Williams Nichols; the oldest son of George Nichols, the head printer in Savannah during the Civil War. William followed in his father's footsteps and also became a prominent printer in Savannah. It was built in 1884 and is a prime example of Italianate architecture of the Victoria Era in Savannah. The house was also owned by Nat King Cole for a time, and has served as a local community center for underprivileged youth. Now lets tour the gorgeous Nichols Suite of this house shall we? 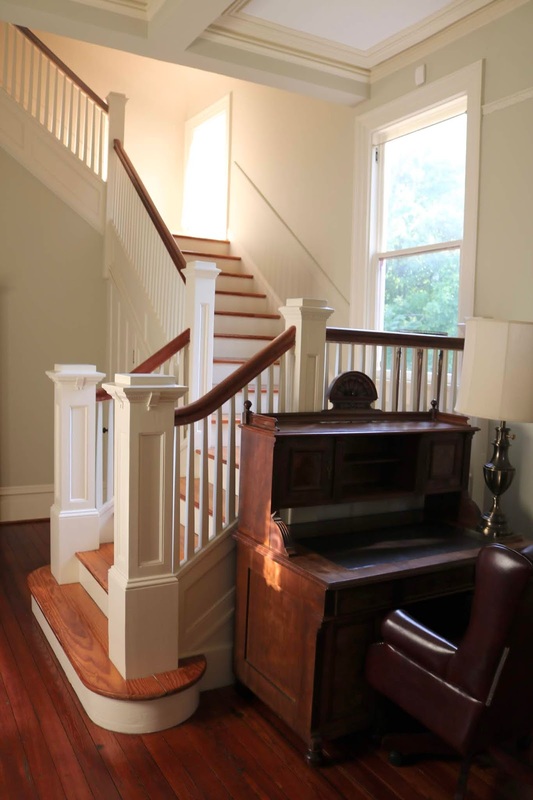 The Nichols Suite is accessed by a private entrance at the front of the house. 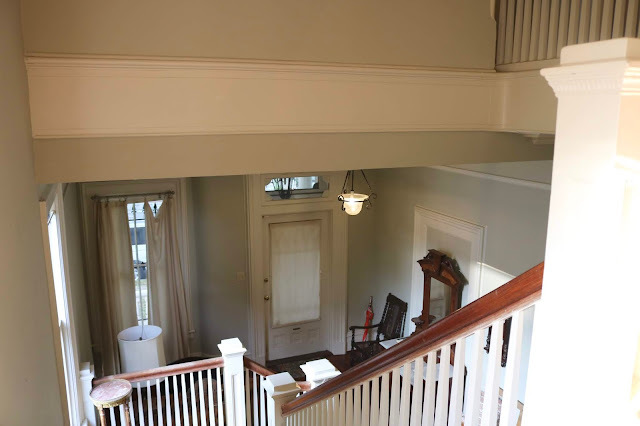 The lower level encompasses the original main entrance and grand stairwell of the house plus a small bathroom. The view when you open the front door. I loved all the light streaming in and the light wall colors. So many older homes are very dark, this home is filled with light! This is the view to the left if your standing in the doorway. The entry is filled with lots of gorgeous antique furniture. 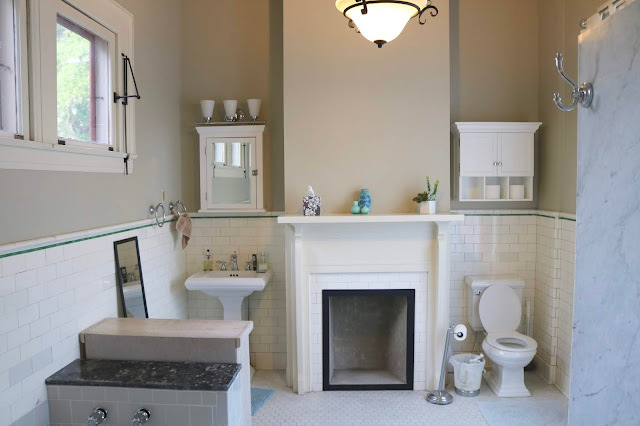 This tiny under-the-staircase bathroom is so cute! We never did use it, because we had a large bathroom upstairs. I suppose it's nice to have a second toilet if the other one is being occupied. The view from the second stair landing looking back at the front door. The upstairs hallway looking into the kitchen. And the view of the hallway in the opposite direction. 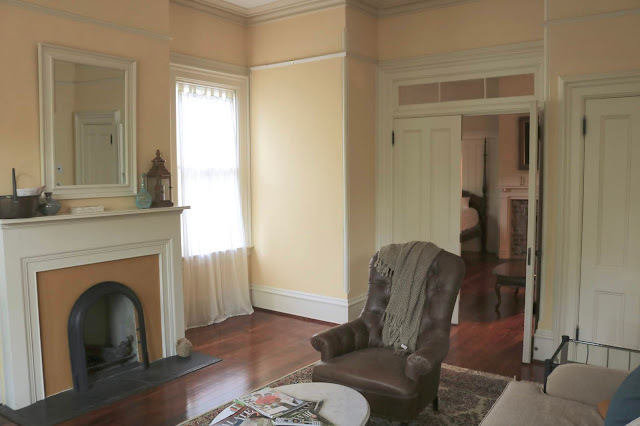 Don't you love the curved walls and mouldings? I love how the wall is panted a soft olive green at the end of the hallway. It really highlights the wardrobe. And this is the view of our bedroom when you just walk into the room. I literally got tears in my eyes when I saw this room for the first time. It is so lovely and romantic. 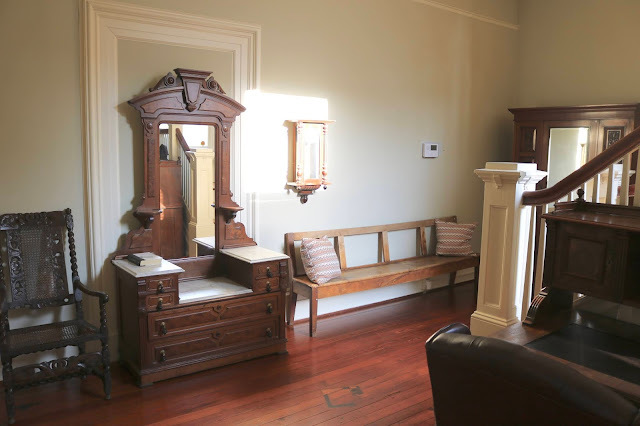 The room has a king size four poster bed, a fireplace (non functioning of course) and a seating area. The frosted glass door leads to a large bathroom. Don't you love the transom windows and the beautiful moulding above the door? Here's the view of the bed and fireplace as seen from the closet wall. This is the seating area in the room looking back into the hallway. The bathroom was large and gorgeous! (You're going to get tired of reading that word, but I'm running out of adjectives! haha!) The bathtub was non-functional, of which we very disappointed about. We walked so much n Savannah, we really would have liked a place to soak at the end of the day. There was a simple standard shower to the right and only one small sink. 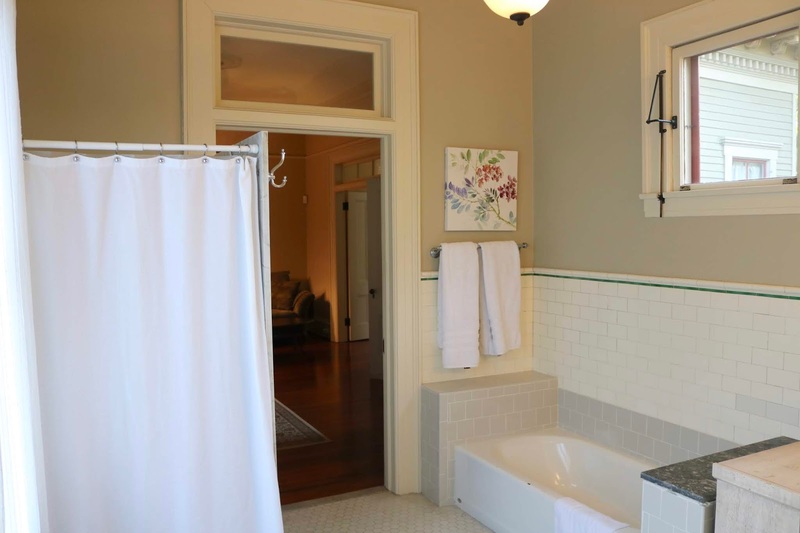 But for what the bathroom lacked in amenities, it made up for in appearance! A view of the shower and tub looking back into the bedroom. The bedroom opened up into a living space where there was another fireplace (there were three fireplaces in this suite), a lovely bay window, and a flat screen TV with over 200 channels. Why, I have no idea, as who s going to watch TV when they are in Savannah? We only had the TV on a little bit to catch the news in the morning, and that was it. The doors to the living space could also closed if someone wanted to sleep while another watched TV. This is the living room looking back into the bedroom. The other opening leads to the hallway. And here is the third fireplace. The room is painted a lovely light yellow and is filled with lots of sunlight. There is also a lovely front street view. We ate our breakfast at this table every morning. My husband loved to open the window and hear the birds sing. We saw squirrels run across the deck just outside the window too! Right off this living area is the entrance to the kitchen. The kitchen was so pretty. I loved the fun windows, and the tin back splash. It was a fully functioning, stocked kitchen. There is no hot breakfast at this inn. The owner stocks the refrigerator with orange juice, bottled water, bagels and cream cheese, muffins, and granola bars. He also included a complimentary bottle of wine (we don't drink, so we didn't open it). Other than breakfast, we ate out every meal. The only appliances we used was the toaster and coffee maker. We really enjoyed our stay at the Printmaker's Inn. This was the first time we stayed in a home instead of a hotel. The reason we chose this place was because all the hotels in the area were very expensive and frankly, I wasn't pleased with their room decor and all the extra charges. When I found this place, I was apprehensive because I wasn't sure how it all worked, but it turned out to be such a positive experience, I will look for more homes to rent in the future. I booked our room through Hotels.com which provided me with a little more assurance than if I just contacted a private party, as all bookings are guaranteed with Hotels.com. Although we paid more per night to stay in this house than we ever had for any hotel on any other vacation we've taken, I think we got quite a bargain compared to what else is available in the area. The rates do go up and down depending on the time of year and whether you stay over a weekend or just weekdays. We stayed Monday through Thursday night which really lowered our costs. The positive experiences we had renting a suite in the house were primarily the space, the atmosphere, and free parking. It felt so nice to have all that space to sprawl around in. It was so roomy and we felt like we were at home instead of trapped in a tiny room. And if you're going to go to a historic place like Savannah, what is better than spending a night in one of their gorgeous Antebellum homes? My husband and I very often in our travels would see one of these large historic homes and wonder what it would be like to live in one. Well, now we know! Because we did get to live in one for almost a week! We were also very pleased with the free parking, because every hotel in the area charged an additional $25.00 a night just to park your car. Yikes! The negative experience of staying at the Printmaker's Inn was the location was a little hike from where all the action was. Although it was located in the historic area just a few blocks from Forsyth Park, it was still quite a walk to Riverstreet where all the restaurants are. There is a free shuttle that stops every 10 minutes that we did take advantage of. Another negative is not having all the amenities hotels have to offer: a pool, a hot tub, a exercise room, turn down service, hot breakfast, etc. All of that was OK with us except the hot tub. Our bodies just ached at the end of the day, and we would have loved a good long hot soak. Finally, we did do a video where I walked through the suite room by room. It gives you a much better idea of the space than just looking at photos. We did it in one take, as we wanted to get out and explore Savannah, so please excuse any mistakes we made. I think I even called the house by the wrong name once or twice...oops! 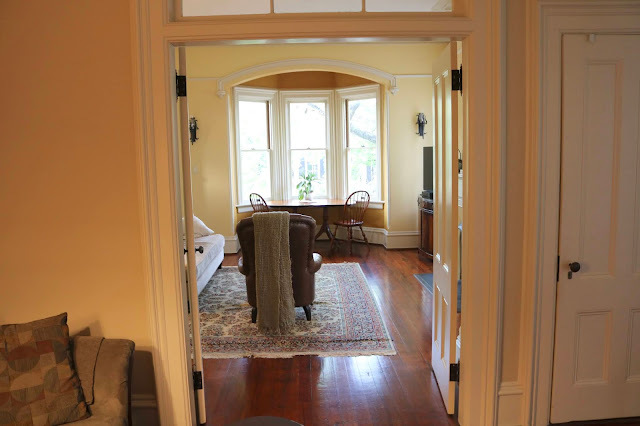 If you'd like to see the other three suites of this beautiful home, HERE is their website. Next week, I'll cover Day 2 of our Savannah vacation, when we toured the Mercer-Williams house! This place has so much character and charm!! I can see why you loved it Amy!! We use hotels.com on a regular basis too. I feel like they have great rates, and I always like to read the reviews from others opinions!! Thanks Jodie! I so agree. I always read the reviews because they really help! What a lovely inn! I will most definitely be visiting savannah one of these days! Thanks Brooke! You will love it! Plan lots of fashion photo shoots...it's a photographers dream! These old homes have so much charm, this one is no different. What a great place to stay at on vacation! It really does! 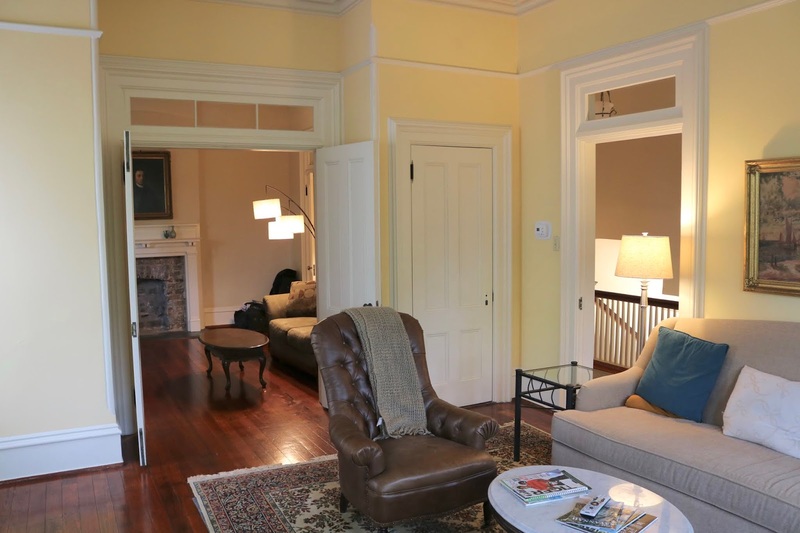 Staying in a historic home really added to our Savannah experience. Amy, just watched your video and you OWN this house! And I want to own it too. Love it, especially that bathroom. Great post, as always, hugs, x. Thank you! I felt like it was all mine when we were there. It felt like home! So much history and southern charm- love it! Yes there is! Thanks for visiting! Thanks Mica! I did a fashion post on that dress if your interested. The house was a nice alterative to a hotel! I just love how thorough your review of this home is! It really makes me want to stay here if I ever visit Savannah, Georgia! I didn't know hotels were so pricey in Savannah, but it's great you did some research and were able to book an entire house on Hotel.com! I love the bathroom, so light and airy... too bad the tub didn't work! The bedroom is gorgeous, too! We would have prob only used the kitchen for breakfast, too... haha, I never want to cook on vacation! I need the break! Hi Carrie, we are budget travelers and so the hotels were expensive to us, but other people might not find it that way. You would love Savannah, you must go sometime! Enjoyed your video tour! Was that a door behind the bed? Thank you! Yes, it is a door. The home was divided into 4 apartments/suites so it must be from the original floorplan. What a lovely place to stay - loads of character and charm. Thanks for sharing with us at #BloggingGrandmothersLinkParty and have a great week! Thanks Sue! It was a wonderful place to stay!